Lighthouse is one of Nightscaping’s® top landscape lighting installers in the country for their Cor-Ten steel outdoor lighting bollards. In the past, one of the only ways to illuminate your driveway or pathways was to use traditional pathway lights. These lights create a runway effect and seem to always have issues with landscapers running them over with their lawn equipment if placed in high traffic areas. Traditional pathway lights are typically constructed with a standard ½” pole, a top hat, a glass lens, and a plastic 8” stake. Many landscape lighting companies (and landscapers who dabble in lighting) use these lights in areas where they should not be installed. This causes issues for the homeowner down the road. Many of these companies are not being trained on how to properly design a landscape lighting system. 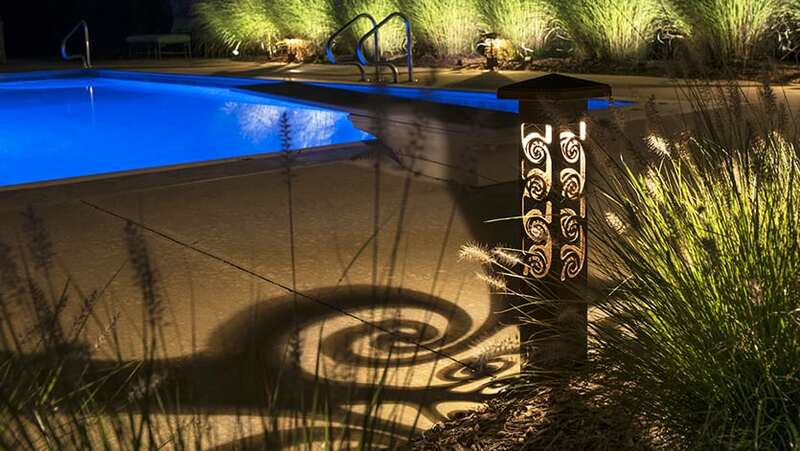 Lighthouse prides itself on being one of the top landscape lighting design firms in the country. This is one of the reasons why Lighthouse uses a wide range of luminaires to illuminate areas of your home or business that give you a lighting system that will last you for many years to come. One of the main reasons Lighthouse chooses to install Nightscaping® Cor-Ten steel light bollards is that it gives the homeowner an outdoor lighting fixture that they will never have to worry about breaking or getting damaged. The Nightscaping® steel bollards are not only built to withstand pretty much anything thrown at them but also are pieces of art that you will want to show off day or night. Lighthouse Landscape Lighting offers Nightscaping’s® full line of Cor-Ten steel bollards. Not only do they offer all of their standard bollards, but Lighthouse can also create any custom design for your home. Nightscaping’s® standard landscape lighting bollards come in three different series: 2 Series (2×2), 4 Series (4×4) and 6 Series (6×6). With the 2 Series, the standard height is 21” and is offered in four different designs. The 2x2s are available in the following design patterns – Diamond, Swirl, Leaf and Circle Cross. Each 2×2 steel lighting bollard creates a unique light shadow pattern that will help to bring your outdoor living areas to life at night. The 4 Series light bollards are offered in 3 different heights (17”, 25” and 37”) and nine different designs. The 4x4s are available in the following design patterns – Diamond, Swirl, Vine, Aspen, Lantern, FLW Circles, Circle Cross, Reed, and St James. These large steel fixtures create beautiful statement pieces when placed around your home or estate. The 6 Series light bollards are the largest luminaires that Lighthouse offers from Nightscaping®. The 6 Series Cor-Ten steel attraction lights are offered in 5 different heights (13”, 21”, 32”, 42” and 80”) and nine different designs. The 6x6s are available in the following design patterns – Diamond, Swirl, Vine, Aspen, Lantern, FLW Circles, Circle Cross, Reed, and St James. 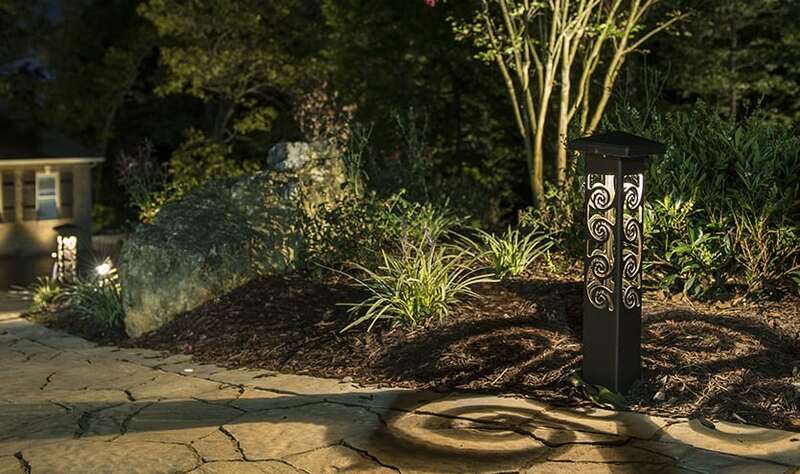 The 6 Series bollards are one of Lighthouse’s favorite fixtures in their full line of landscape lighting products because they make a powerful statement. If you are looking to give your yard a new look or jazz up your outdoor living space, please give Lighthouse a call today. Lighthouse is your preferred Nightscaping® installer. Tim Ryan has been in the landscape lighting field for over 24 years. He leads the education and training, current product field evaluation and new product development, franchisee technical and design support and sales assistance for Lighthouse Outdoor Lighting. Tim has a passion for photography and videography and it shows in his work. He is a member of the AOLP (Association of Outdoor Lighting Professionals) and carries a CLVLT certification rating. (Certified Low Voltage Lighting Technician). Tim is the 2018 AOLP winner of Excellence in XL Residential project, Merit in Large Residential project, Honorable Mention in Small Residential project, Excellence in Feature Focused project and overall Best of Show. Lighting Controls for Outdoor Lighting- A Good Value?